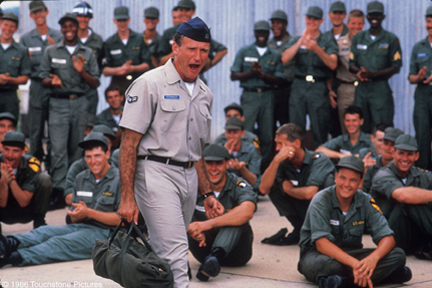 Radio funny man Adrian Cronauer (Robin Williams) is sent to Vietnam to bring a little comedy back into the lives of the soldiers. After setting up shop, Cronauer delights the G.I.s but shocks his superior officer, Sergeant Major Dickerson (J.T. Walsh), with his irreverent take on the war. While Dickerson attempts to censor Cronauers broadcasts, Cronauer pursues a relationship with a Vietnamese girl named Trinh (Chintara Sukapatana), who shows him the horrors of war first-hand.